Britta Ambauen's bracelet allows you to find moments of relaxing meditation throughout your day. Across all cultures and times, meditation has been a way to keep conscious minds focused on simple tasks: walking a winding path, simply breathing. 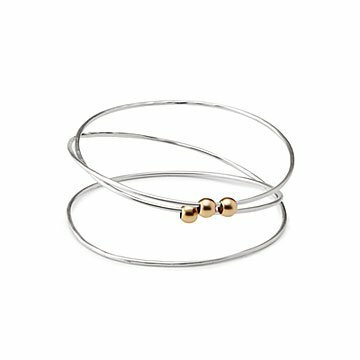 Britta Ambauen's handmade bracelet brings a stylish spin to that ancient practice, letting you carry your meditation with you throughout the day. She crafts an endless spiral of sterling silver, along which slide three 14K gold-filled beads. Whether you're at home, at work, or waiting at a red light, you can move the beads along their perpetual pathway as a way of staying in the present moment and relaxing your mind. Handmade in Washington. Wipe gently with anti tarnish cloth.